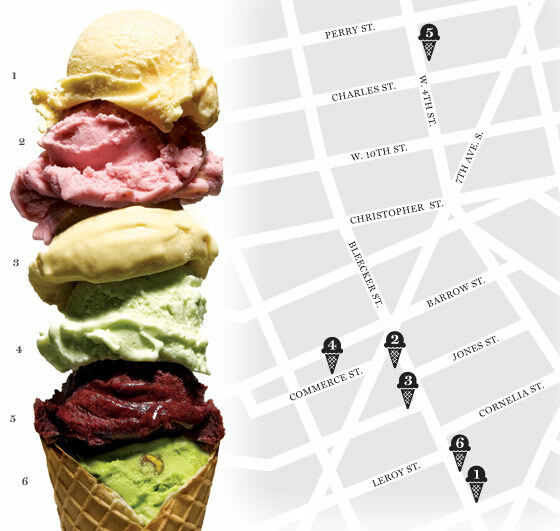 With the arrivals of Grom two months ago and the nearby L’Arte del Gelato last summer to a strip already inhabited by the decade-old Cones and landmark Rocco’s, this stretch of Bleecker Street and the surrounding south Village area has officially emerged as Manhattan’s gelato district. It’s now possible for the intrepid ice-cream licker to toddle from one shop to another, sampling a nocciola here and a pistachio there, comparing and contrasting and scrounging as many tastes as store policy dictates—which, of course, is exactly what we did. Here’s how they stacked up. An ingredient-fetishizing, Slow Food–inspired juggernaut, with fifteen branches in Italy and another uptown. Where Made: Gelato base flash-frozen in Italy, daily whipping done on-site. Price: $4.75 for a small. Verdict: The purest, cleanest, freshest flavors, with a dense, rich texture. The winner. This up-and-coming mini-chain was founded three years ago with a Chelsea Market stand under the not-so-confidence-inspiring name Jimmy’s Gelato—“Jimmy” being, according to expat Sicilian partner Francesco Realmuto, the closest American equivalent of his father’s name, Vincenzo. When that didn’t catch on he rechristened it L’Arte del Gelato and expanded last year with this West Village branch. Don’t Miss: Stracciatella, cassata Siciliana, biscotti, Nutella. Price: $3.95 for a small cup. Verdict: An exemplary smooth-but-firm texture, and a wide range of flavors that are well-balanced, if not quite as pure as Grom’s. When Häagen-Dazs brazenly set up shop in Raul and Oscar D’Aloisio’s native, gelato-crazed Buenos Aires, the brothers decided that Americans had a lot to learn about ice cream, so in 1998 they opened this homey little storefront. Don’t Miss: Dulce de leche, corn with an optional sprinkle of cinnamon, Johnnie Walker Black Label with macerated kumquats. Price: $4.15 for a one-flavor cup. Samples: Two when it’s busy; otherwise up to eight, but a taste of the Johnnie Walker–kumquat flavor will cost you a buck. Verdict: A properly dense texture and many unique and delicious flavors, though some err on the side of sweetness. This custom-baked-cookie specialist also operates as an under-the-radar outpost of Il Laboratorio del Gelato, with a rotating assortment of five to seven flavors scooped individually or showcased in a multitude of ice-cream sandwiches. Don’t Miss: A single scoop and whatever cookie just came out of the oven. Where Made: At the lab on Orchard Street. Price: $2.25 a scoop; $4.50 a sandwich. Verdict: Hit or miss, depending, perhaps, on storage conditions and turnover; vanilla was creamy perfection one night, while mint tasted stale and gummy. On the sandwich front, the ice cream tends to squish out the sides. The super-soigné Upper East Side pasticceria spawned this downtown branch a few years ago and brought its celebrated gelati with it. A discreetly located freezer case holds a selection of classic flavors, which you may enjoy in the eccentric-people-watching splendor of the sidewalk café or to go, in a small pink paper cup. Don’t Miss: Caramel gelato; iced latte. Where Made: Their East Harlem facility. Price: $3 for a small cup. Verdict: A good gelato that might have seemed like the last word on the subject a decade or two ago, but it’s not on the same level as its nearby competition. Tourists flood this 34-year-old throwback, where the pastry cases beckon, the tables are waiter-service only, and regulars nurse their cappuccinos for hours. Don’t Miss: Of the dozen gelati, the Nutella is too sweet, the peanut butter is chunky and overly rich, and the toasted almond is airy and soft instead of dense and creamy. On the other hand, the sesame cookie hits the spot. Verdict: A great place to soak up some old–New York ambience, but not necessarily a gelato destination—unless you gravitate to supersweet and airy rather than balanced and dense.